Attach to a hero. Attached hero gets +1 Attack when attacking an Orc. Response: After attached hero attacks and destroys an enemy, place 1 progress token on the current quest. 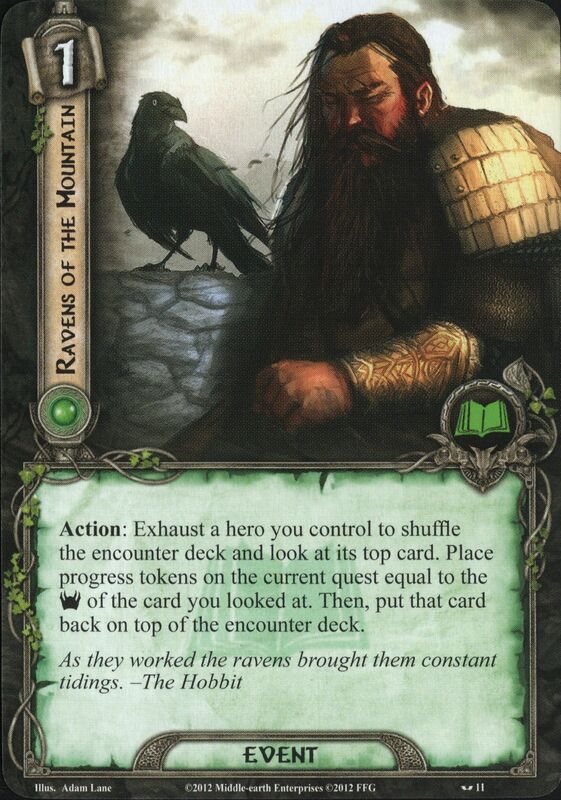 Response: After Longbeard Elder commits to a quest, look at the top card of the encounter deck. 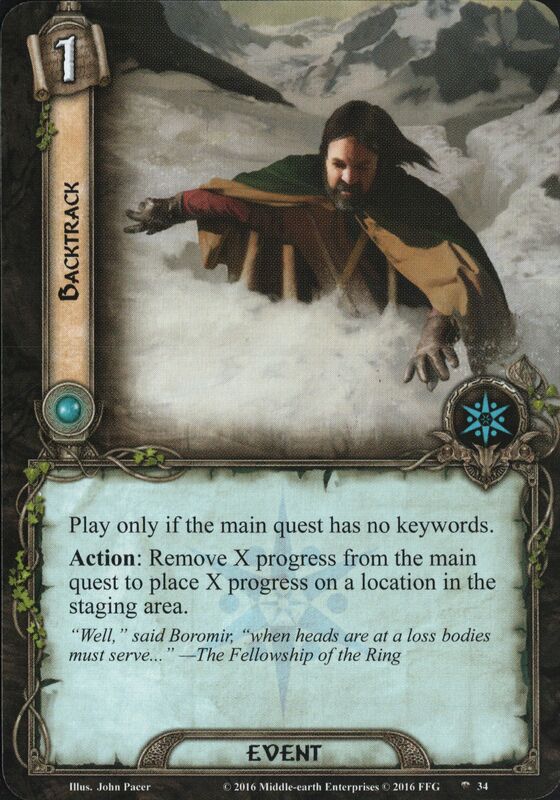 If that card is a location, place 1 progress token on the current quest. Otherwise, Longbeard Elder gets -1 Willpower until the end of the phase. Action: Place 2 progress on any location. Resolve that effect again for each copy of The Evening Star currently in your discard pile (you may choose new targets). Response: After Mirkwood Explorer quests successfully, place 1 progress on it. Action: Exhaust Mirkwood Explorer to move all progress from it to a location in play. Attach to a hero or Legolas. Response: After attached character participates in an attack that destroys an enemy, exhaust Arod to place 1 progress token on any location. When Revealed: The first player chooses a player to take control of Ranger of the North. Then, either deal 2 damage to an enemy or place 2 progress tokens on a location. Response: After you engage an enemy, exhaust a Scout or Ranger character to place X progress tokens on a location. X is the engaged enemy's printed Threat. Cannot have restricted attachments. 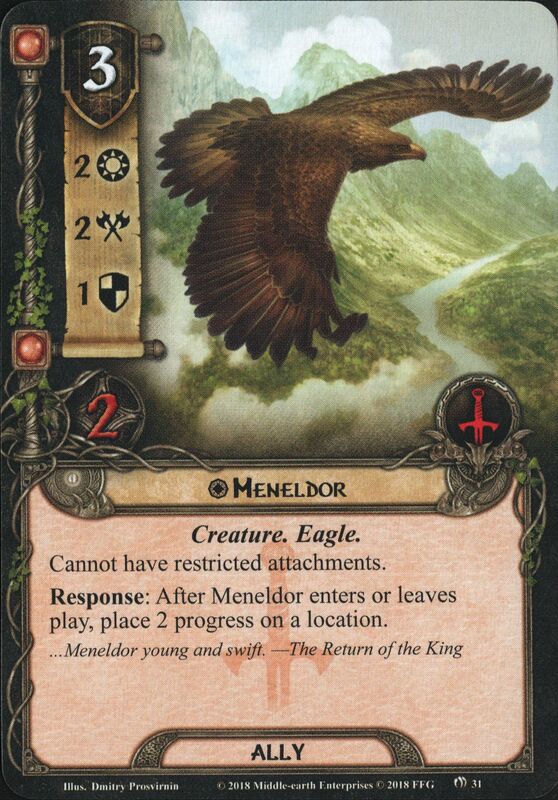 Response: After Meneldor enters or leaves play, place 2 progress on a location. Action: Exhaust a Ranger or Scout character to discard a non-unique active location. 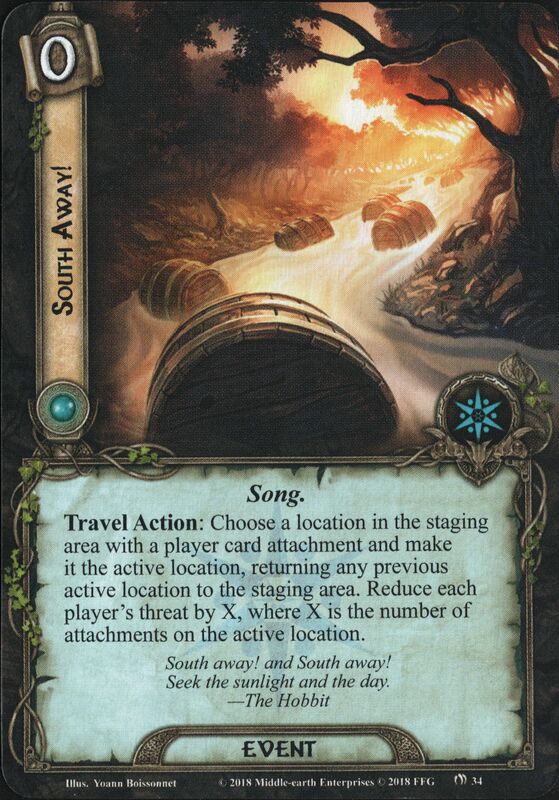 Then, search the encounter deck and discard pile for a non-unique location and make it the active location. Shuffle the encounter deck. Attach to a Leadership or a Scout character. Response: At the beginning of the travel phase, exhaust Mariner's Compass and attached character to search the top 5 cards of the encounter deck for a location. Switch that location with a location in the staging area. Shuffle the encounter deck. 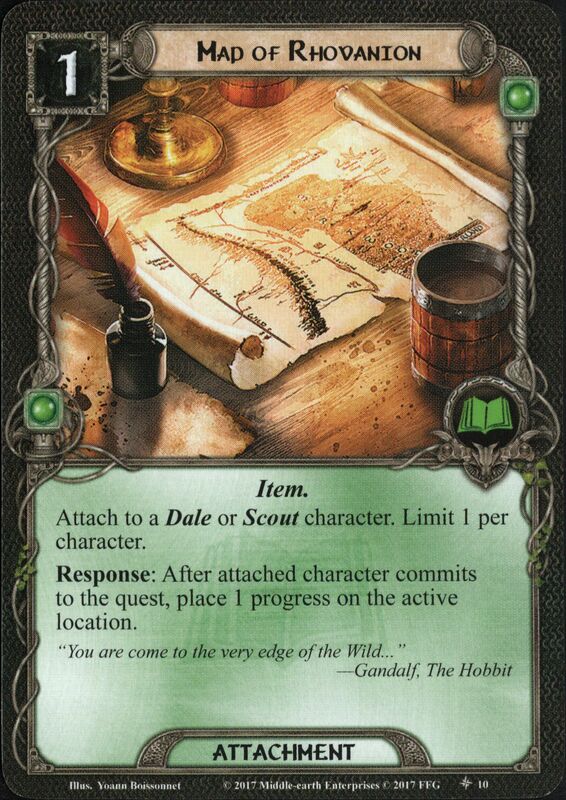 Response: After a location enters play, exhaust a Hobbit character to shuffle that location back into the encounter deck. 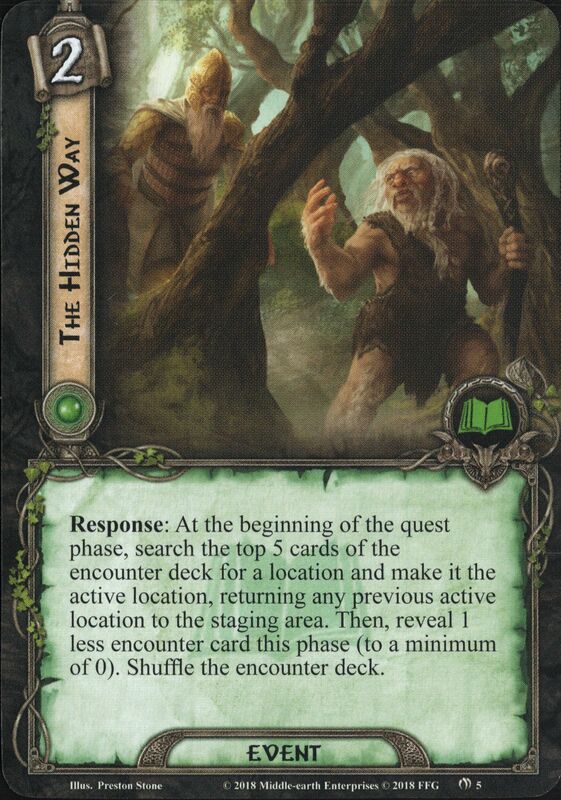 Then, reveal 1 card from the encounter deck and add it to the staging area.